It is often valuable to know which items in an inventory are experi­eSncing exceptional usage, either much greater, or much less than the forecast usage. 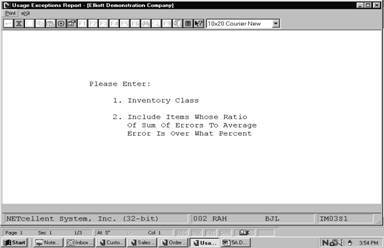 The Usage Exceptions Report application allows you to choose a particular inventory class (A, B, or C) and to have a report printed for that class showing all items which have varied from the forecast usage by whatever percent you choose. For additional information on ABC Analysis, please see the in the Item File Maintenance section. The items are selected for the report by calculating the ratio of the sum of errors to the average error for that item and comparing that figure to the one you enter. Enter A, B, or C to indicate which in­ventory class is to be included on the report. All items greater than this percent will be printed on the report. For example, if 200% is entered, any items which have a sum of errors twice as large as the average error would appear on the report. The items that appear would be items, which have been consistently over or under the forecasted.